Dunster famed for its castle, is a well preserved medieval village that has hardly changed since the roundheads besieged and conquered the castle. The village steeped In history is well worth spending some time in. Today a hole made by a cannon ball can still be seen in a beam in the famous old Yarn Market opposite the hotel. The octagonal market was erected in 1609. Traders would be found under cover carrying out their business through the openings. At the foot of the high street, directly ahead is the steep climb to the castle, but a sharp turn right takes you into Church Street and a quieter but equally charming part of the village. On the right is the Priest House, a 16th century cottage built from ship’s timbers which forms the entrance to Dunster Church, dedicated to St. George in the shape of a cross, the main body of the church is 15th century, but the Norman West Door and 13th century stone altar in the north chapel come from on earlier building. Through the North Door is The Priory Garden. The castle near the village, standing in the beautiful wooded grounds, contains some rare portraits, a banqueting hall, and a superb carved staircase. The castle and gardens are open Tuesdays to Thursdays, July to September. A medieval circular dovecote probably built in the 12th century as part of a priory, can usually be visited daily (except Sundays) from May to September. 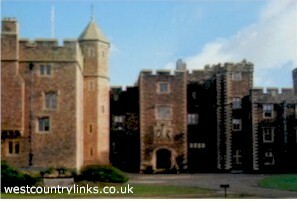 Dunster is an oasis of historic interest and a visual delight and should not be missed.